Aaron Johnson & Ken Wunch, Dow Energy & Water Solutions, explore approaches to sustainable water management in oil and gas operations. Population growth, emerging economy urbanisation and industrialisation, freshwater scarcities, and environmental pressures are converging to generate enormous performance imperatives for the hydraulic fracturing industry as it strives to meet steadily rising worldwide demand for energy. Increasingly, operators are harvesting oil and gas from previously inaccessible sources, ranging from deeply embedded shale and oilsands to deepwater and ever more high-temperature, high-pressure reserves. Figure 1. Water in the hydraulic fracturing process. Water is an essential component in the shale production process and a number of water issues must be managed, such as finding economical and sustainable means for water acquisition, water utilisation, wastewater disposal and water reuse. In recent years, the impact of oil shale recovery on the environment has become a subject of much discussion and debate and has put the issue of responsible water stewardship at the forefront. These challenges are complex and difficult for any single party to solve and require multidisciplinary science and technology solutions. With 32% of total estimated global natural gas reserves and 10% of estimated oil reserves in shale or tight formations,1 the resolution of the public concerns and development of safe, sustainable water management in hydraulic fracturing is critical to the industry and the energy-dependent world. Generally, hydraulic fracturing refers to a process of stimulating tight rock formations, often drilled a mile or more below the earth’s surface, to enable the release and extraction of crude oil and natural gas. Often, the source water used to create the fracturing fluid must be filtered or treated before use to ensure unwanted salts and compounds do not interfere with the performance of the chemically enhanced fracturing fluid. For example, self-cleaning filters remove fine solids in the water to help protect high-pressure pumping equipment and reduce interference with fracturing fluid chemicals. 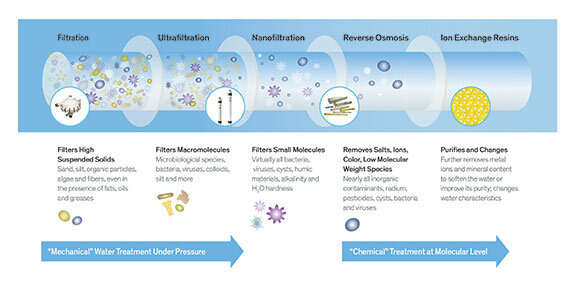 Ultrafiltration membranes further reduce turbidity and provide virtually particle-free water to reduce unwanted interaction of the fluid chemistry with the particles themselves and/or enable more advanced treatment, such as reverse osmosis desalination. Nanofiltration and ion exchange technologies help tailor the final water composition to further optimise fluid chemistry and meet the specific fracturing fluid requirements (Figure 2). Additives are also added to the fracturing fluid (making up less than one percent of the composition) to control unwanted bacterial growth in the water that can corrode pipes and lead to groundwater contamination. Once the hydraulic fracturing process is complete, some of the fracturing fluid – now called flowback water – must return to the surface to allow the well to produce. The flowback water typically contains not only the original fracturing fluid ingredients, but also hydrocarbons, minerals and other substances from the shale itself. In the early days of hydraulic fracturing, flowback water was often trucked away and disposed of in injection wells, or collected in evaporation ponds. Increasingly, producers are recycling and treating flowback water so it can be used in the next hydraulic fracturing job. This minimises the cost associated with transportation to a disposal well or municipal wastewater treatment plant. Flowback water treatment techniques and technologies vary depending on the quality of the produced water and various water quality standards, but they can include using self-cleaning fine particle filters to remove suspended solids and polymeric adsorbents for organic compound removal. Additionally, selective ion exchange resins and processes might be used to remove unwanted components, such as boron. Longer term, the wells producing shale oil and gas will continue to produce water. Although the volumes of produced water are significantly smaller than water returning during flowback, the cumulative impact of produced water from many wells can be quite strong over time. Water is integral to nearly all hydraulic fracturing operations. A typical new horizontal shale gas or tight oil well requires 3 - 5 million gal. of water, with large multistage fracturing operations commonly requiring over 10 million gal. To get an idea of how much water that is, if a bathroom tap was left running non-stop for about a year, it would use around 1 million gal. (bath taps generally run at 1.5 - 2 gal/min. ).3 Yet, hydraulic fracturing-related water use does not necessarily stop after the well has been opened. Due to the Bakken’s high-salinity groundwater, its more than 10 000 currently producing wells (as of July 2015) each require more than 600 gal. of maintenance water a day to prevent salt build-up from restricting oil flow, according to North Dakota’s Department of Mineral Resources (DMR). Over an average Bakken well’s 30 - 40 year projected lifespan, which is an additional 6.6 - 8.8 million gal. of water needed for each well.4 In the next 10 to 20 years, when the Bakken is fully developed, DMR officials project it will have 40 000 - 45 000 producing wells, which will need as much as 10.2 billion gal. in maintenance water to keep producing oil.5 As this shows, widespread energy production is not possible without water. Hydraulic fracturing is often performed in areas where water is scarce, such as the western regions of North Dakota and southwest Texas, or near major population centres, with little oil and gas infrastructure, like Pennsylvania. This makes water recycling that much more important to reduce the impact of hydraulic fracturing on local water resources, as well as infrastructure. Of equal concern to the oil and gas industry is the need for precision water quality to ensure that unwanted salts and compounds do not interfere with the performance of the fracturing liquid. Numerous water treatment technologies are available today to help producers reuse water and improve shale-based oil and gas recovery, while, at the same time, minimising the environmental impact during the hydraulic fracturing process. Many of them are relatively unfamiliar to the oil and gas industry, including ultrafiltration, reverse osmosis, nanofiltration, and ion exchange, but these advanced water treatment technologies are widely used in other industries where water scarcity demands reuse and conservation. Existing water treatment technologies not only make it possible to use the lowest quality source water available for fracking, but contribute to higher production at lower costs. For example, BNN Energy helped its customer, an oilfield operator in Colorado, reduce water sourcing costs and environmental impact by integrating TEQUATIC™ PLUS F-75 Filters into its containerised water filtration system, as an alternative to bag filters. The oilfield operator has since increased the volume of recycled produced water to almost 100%, and expects to save about US$2.00/bbl of water, reducing operating costs by about 60%. In Texas, the Eagle Ford hydraulic fracturing operations rely on an innovative mobile water treatment unit to treat flowback and produced waters. This system combines nanofiltration, ultrafiltration and reverse osmosis membrane technologies to reduce water hardness and boron levels, and to selectively remove ions – such as calcium, magnesium and sulfate. The operator is now able to reuse the high-salinity produced water that would otherwise interfere with fluid and formation chemistries, and reduce the use of freshwater resources in a state experiencing severe drought conditions. Additionally, in late 2013, a major oil and gas producer in Riverton, Wyoming, built what will be the third-largest water treatment plant of its kind in the world.6 It can treat as many as one million gallons of water a day, treat 750 gal. of produced water per minute and create 900 000 gal. of clean water per day. Examples such as these demonstrate how technology-led water treatment solutions can ultimately lead to beneficial outcomes for both producers and the environment. Bacteria will grow just about anywhere water can be found. In hydrocarbon production and processes, the large volume of associated water provides an environment in which bacteria will thrive. Their presence impacts the quality and quantity of production, but also the safety of operations. Uncontrolled microbial growth contributes to the souring of production, corrosion of pipelines and equipment, the plugging of reservoir pore throats and the biodeterioration of other production chemistries. Advanced stimulation techniques, like hydraulic fracturing and enhanced oil recovery, are more water-intensive processes that provide opportunities for bacterial contamination if not properly controlled with an effective microbial control programme. An effective microbial control programme incorporates the needs of each phase of the hydraulic fracturing process – preparing the water topside, decontaminating the well, and protecting the reservoir. A tailored biocides programme can help control microbial growth and microbially-influenced corrosion, reduce well and reservoir souring, and improve production and resource recovery safely and sustainably in a variety of hydrocarbon operations. As the global population continues to grow and the world gradually transitions to a sustainable, lower-carbon energy future, balancing the need for clean water and energy will remain a top priority for the oil and gas industry. The adoption of innovative technologies in water reuse will support the industry’s movements toward sustainable and efficient hydraulic fracturing best practices. Producers and regulators must continue to explore ways to adopt treatment processes and technologies to ensure sustainable industry practices. U.S. Energy Information Administration, ‘Shale oil and shale gas resources are globally abundant’, http://www.eia.gov/todayinenergy/detail.cfm?id=14431. (January 2, 2014). www.fas.org/sgp/crs/misc/R40894.pdf; U.S. Environmental Protection Agency, www.epa.gov/WaterSense/pubs/indoor.html. (October 30, 2009). National Geographic, ‘North Dakota’s Salty Fracked Wells Drink More Water to Keep Oil Flowing’, www.news.nationalgeographic.com/news/energy/2013/11/131111-north-dakota-wells-maintenance-water/. Casper Star Tribune, “New water treatment facility would be first in Wyoming’, http://trib.com/business/energy/new-water-treatment-facility-would-be-first-in-wyoming/article_93381566-fde7-5892-91f8-50d15444b10e.html (December 18, 2013). This article was originally published in Oilfield Technology magazine. To receive your free copy, click here.